In this day and age of visual effects, rotoscoping is a necessity within the VFX pipeline. Though it is time-consuming and occasionally tedious, rotoscoping is used in almost all action or animation scenes, allowing effects to be composited onto a variety of backgrounds. 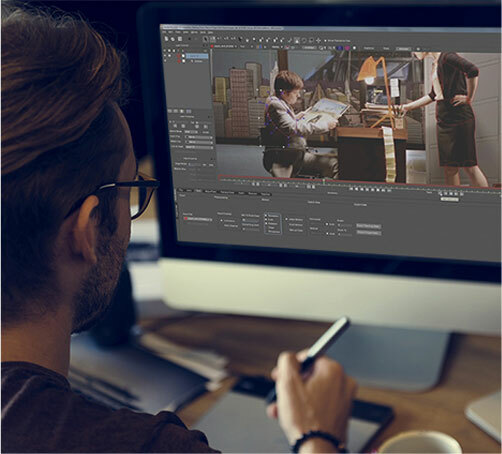 Providing high-end rotoscoping techniques, Back Office Pro is a premiere rotoscoping outsourcing company, staffed by experts with a passion for VFX. Creating seamless, naturally-flowing video sequences, our team of animators utilizes skill, passion and state-of-the-art equipment to minimize boil and create perfect mattes. The team is comprised of digital artists who are well-versed in traditional art and design skills, with a strong knowledge of composition and color. Experienced in large and small-scale production, the rotoscoping team has worked on everything from advertisements to films for various post-processing purposes, including VFX Compositing, Stereo Conversion or Color Correction. Well-versed in versed in top-shelf rotoscoping packages and additional tools such as Autodesk’s Advanced System, Flame, and Smoke, Adobe After Effects, Digital Fusion, Nuke, Silhouette, Mocha, 3ds Max, Maya, AutoCAD, and more. Proficiency in additional design and modeling tools, including 2D and 3D modeling and animation tools, making use of specialized digital artists for each post-processing operation. Capable of common rotoscoping and paint operations, including precise tracing, hard and motion blur mattes, nuke or silhouette splines, visual effects, stereoscopic 3d conversion, matte painting, using patches and frame-by-frame painting techniques to remove rigs and tracking markers, de-graining and re-graining paint work, 3D tracking including 1, 2 and 4 point tracks, composing and reconstructing pictures, camera tracking, planar tracking, 2D tracking, using geo data to project clean plates, using UV projections, keying, grading, re-timing and screen insertion. Knowledge of all key tools and techniqus to do color coding and naming splines, directional feathering, edge softening, temporary points, motion blur mattes based on direction and velocity, curve editing for fine tuning keyframes, filtering and scripting, rotating and scaling splines and selected points, as well as global position offsets. Matte Creation (keying, rotosplining, and painting): Creation of precise holdout mattes, sometimes referred to as masks or alpha channels. Combining tools and techniques such as Extraction, Rotosplining and Painting, Luminance keying, and Mask Overlay, the team is able to produce accurate rotosplines and complex mattes to support the most outstanding special effects. Effects Painting Rather than creating elaborate particle effects in 3D simulation software, skilled paint artists can quickly and accurately add effects to a scene, whether frame-by-frame or using automation tools. Cloning/Paint Touch-Ups Skilled artists touch up film or video footage by removing wires and rigs or logos, dust busting and removing scratches, with a strong focus on temporal and spatial cloning. Motion Tracking Utilizing precise motion tracking for stabilization or match-moving purposes, including 1, 2, 3 or 4-point tracking, and full object or camera tracking via unlimited point tracking, the team ensures spatially-accurate depth-mapping effects. Stereo Roto Workflow Flawless integration for the material is shot with two cameras. Stereo workflow helps to integrate roto objects or items seen by both eyes, making viewing more comfortable. Stereo Conversion Using rotoscopy to isolate elements in a mono-shot sequence, stereo conversion allows for the creation of a depth map, allowing for a second 'virtual' camera to be produced - with the correct offset for stereo parallax. These roto shapes can then be combined to build up a manual depth map (z-map) of roto-based shapes that define the depth of a scene. Outsourcing chroma keying and rotoscoping to Back Office Pro’s highly experienced team gives digital video editors and visual effects designers the opportunity to focus on the stimulating aspect of visual effects. With minimal investment, as well as reduced costs and improved process procedures, outsourcing the time-intensive task of rotoscoping provides administrative savings, and with a standard output, results are easily measured, providing minimal risk. Back Office Pro’s infrastructure offers fast and intelligent handling of large, open EXR, DPX, and other files, with 4K files being not uncommon, while flexible and scalable resources allow us to handle any deadlines and time-frame needs. Experienced in all stages of post-processing, the team provides high-quality rotoscoping by optimizing control points and number of keyframes and effectively deconstructing and recomposing shapes via multiple rotosplines. Support staff, including experienced account managers and project managers ensures a smooth delivery process and continuous client communication throughout processing, while the extended team covers all areas of video post-processing. Providing dedicated resources, FTEs, or on-demand hourly contracts, Back Office Pro is dedicated to creating lasting partnerships, with a long track record of successful projects. If you would like to know more about our rotoscoping services, click Contact Us and we will get in touch with you within one business day to grow a detailed understanding of your requirements.